Critical Outcast: News: Hudson Horror Show #11 is Coming! 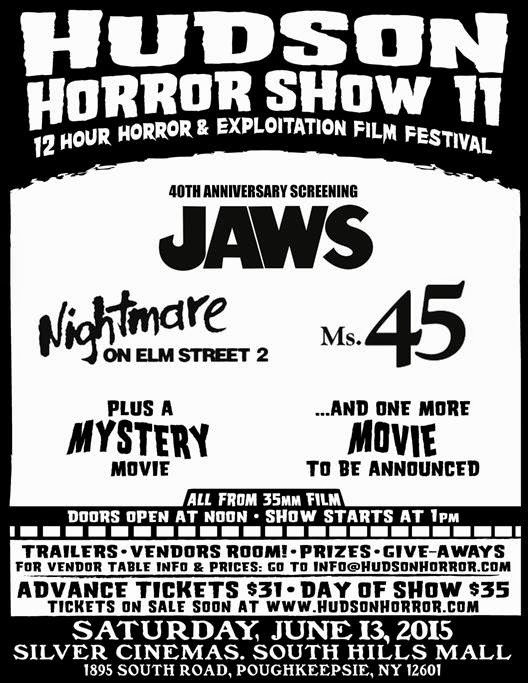 News: Hudson Horror Show #11 is Coming! If you know me, you know how much Hudson Horror Show means to me. It is not something I can easily explain, and also something that has grown over the course of the group's ten shows over the past five years. I think what really struck it home for me was how I felt when they almost folded following the loss of their venue after their eigth show. Fortunately, the venue was saved allowing them to continue playing host to the movie marathon. This led directly to the success of their return show this past August, and only built throught the tenth show (which sold out in 4 days). With a their 11th show fast approaching, you will not want to be left out in the cold. Knowing how quickly the last show sold out, you are not going to want to wait when tickets go on sale. They have a great show lined up and it is surely going to sell out in no time. If you blink, you will surely miss out. Their past few shows have been sell outs, and remember, this is coming on the heels of a sold out triple feature event at the Alamo Drafthouse, where they screened Giant Spider Invasion, Blood Beach, and Sleepaway Camp! This time out they have announced some great stuff already, including films sponsored by B Movie Film Vault (run by my buddy, Jordan) and Vinegar Syndrome (who sponsored Night Train to Terror at the last show). Fresh off a sold out show at the Alamo Drafthouse, Hudson Horror Show returns to the hallowed grounds of the Empire South Hills 8 in Poughkeepsie, NY! In our sixth year and presented by Vinegar Syndrome and the B Movie Film Vault, Hudson Horror #11 is a 12 hour retro film festival, with all movies being presented from vintage 35mm films. Show #11 features five full length movies plus dozens of retro trailers and ads, plus vendors selling horror related toys, t-shirts and more! B Movie Film Vault will open the show with A MYSTERY MOVIE! We don’t know what it is, but we know it will be good. OK, maybe it will be bad. But we guarantee it will be fun, and it will off 35mm. As always we’ll have vendors selling toys, DVD’s, t-shirts and other merchandise. Vinegar Syndrome will be set up selling copies of MADMAN and all of their other DVD’s and Blu Rays. If you are interested in being a vendor, or if you have a question about the show, shoot us an email at info@hudsonhorror.com. Keep watching our website and Facebook page for more info and we’ll see you on Saturday, June 13th for Hudson Horror Show#11!